Our unit of the UMW called the Orchard Circle, is an organized community of women purposefully growing with God. We passionately meet to develop supportive fellowship and expand concepts of mission through participation in the global ministries of the church. Orchard Circle is a group of women of all ages who support missions both locally and nationally. As members we strive to grow spiritually through Mission Studies supported by our District UMW and by offering supportive fellowship for all women. Sponsoring various day trips offers time with other women to build new relationships with focus on Christian principles. The Orchard also hosts various fund raisers each year in order to support other church and local missions. Typically, the Orchard Circle meets the 3rd Monday evening of the month (but not every month). The meeting begins at 6:30pm with light refreshments and time to socialize, with our official meeting beginning at 7:00. We meet in ther Fellowship Hall of Orange UMC, unless otherwise noted. We began the year with our annual “High Tea” Party at the home of our gracious host, Judy Powell. We had 23 Ladies participating this year. And as you see, hats are a requirement! (See more pictures on our Facebook page). In February, we had Guest Speaker Sandy Reed, Founder and Director of Bethany Place, here in Canton, along with her daughter, Nivea. Bethany Place is a nonprofit home, founded in 1988, for single women, and single mothers who need help getting their lives back on track. They provide housing, training and spiritual guidance for the women while they are in the program. She moved us with her talk about how her program helps young women in trouble to find Jesus Christ and restructure their lives. Sandy related many heartbreaking, and joyful stories of the women they take care of. They have a wonderful store with many items for sale that help with this ministry. Center, Free Home Elementary School, Bethany Place, Methodist Children’s Home, and House of Hope Ministries of Free Home. In addition, we give support to our church through purchasing UPPER ROOM magazines, contributing to the Children, Youth and Boy Scout programs, sending cards to home-bound members, and purchasing Christmas decorations for the sanctuary. In March of last year, we had a guest speaker: Mrs. Jane Lathem, who spoke to us about the critical needs of the people and the church in Venezuela. Jane and her husband Dr. Warren Lathem have done mission work in Venezuela for many years. They established the Wesleyan Seminary there to train new pastors and help establish new churches. Unfortunately, their work has been interrupted by the current dictatorship government which banned outside missionaries. However, through God's Grace, the Seminary is still in operation and is now expanded to include a much needed medical center. Children are dying from starvation and simple diseases. She asked that we consider supporting Venezuela Now which operates through the seminary and distributes food and medical supplies to the people. Find out more at www.facebook.com/VZNOW and www.VenezuelaNow.org. But we’re not just about hard work! 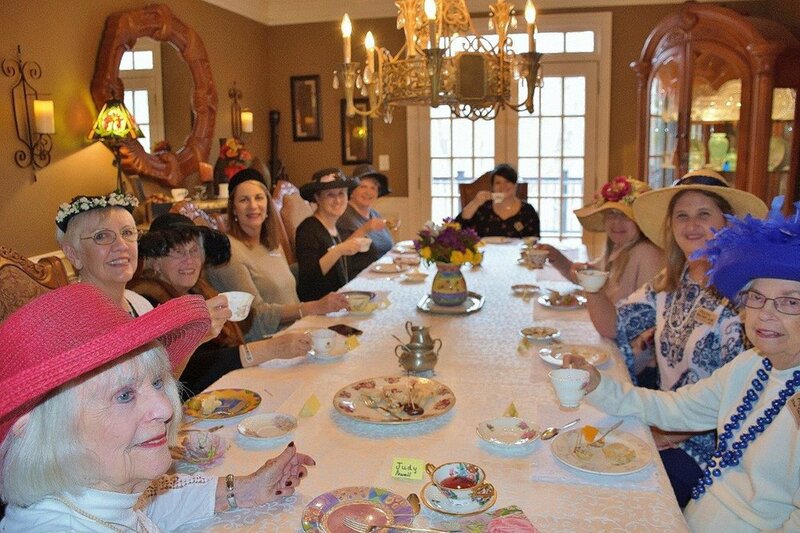 We have fun fellowship times like our High Tea Party held in January and our fun retreats to places such as Callaway Gardens and the Little White House. Come and join the fun!. It is a joy and a blessing to be a part of this group of loving, caring, fun-loving, Christian ladies.